It’s now late night on the 17th of February, and not only is internet access sparse out here, but having time and electricity to sit at a computer is also nearly impossible. Tomorrow is our Thai wedding (the second of 4 ceremonies in our Wedding World Tour), and we have to be up in 6 hours. I’m beyond exhausted, but I’m trying to somehow keep up on this. I know that when we go out into the Mara in Kenya we won’t have any internet, so there will be a big gap. I owe full explanations for everything — which I will do by separate posts — and lots of pictures. But for now, here’s a recap of where we’re at as well as a few unedited pictures. 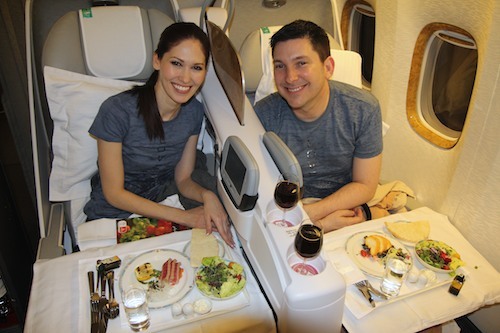 Day 1 & 2: amazing flights on Emirates, blogged about earlier. 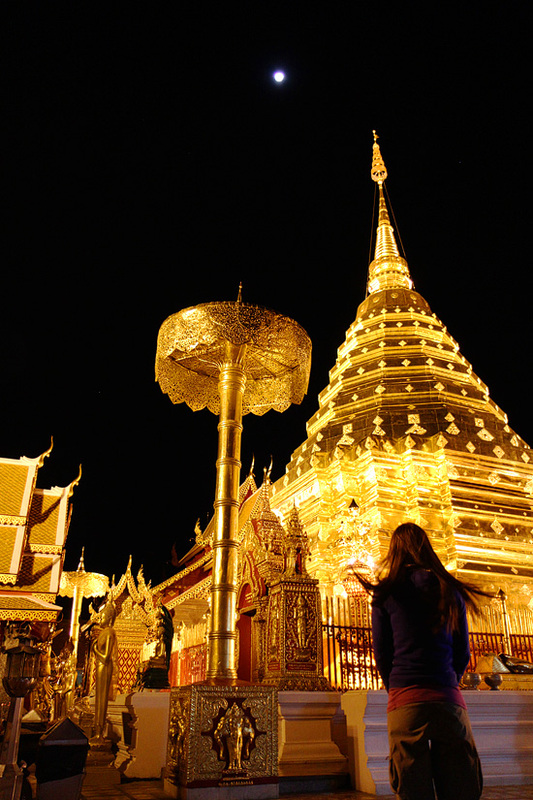 Day 3 (Feb 15): First day in Chiang Mai … took a sightseeing tour, visited the most amazing, spiritual place either of us have ever been to, Doi Suthep. 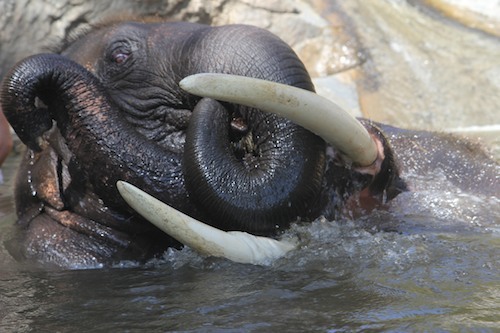 Day 4 (Feb 16): Another experience-of-a-lifetime: getting to know an elephant, cleaning her (him in April’s case), riding him to a pool, swimming with elephants in the pool (absolutely amazing! 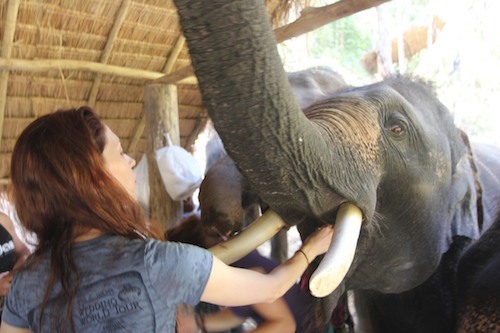 ), an incredible lunch, then riding back … plus spending time with a 5-day old baby elephant, born on our first wedding day. Day 5 (Feb 17): Today was a Thai cooking class, very fun! Then the journey to Lampang, where we met up with Mom Marcia and Jack. 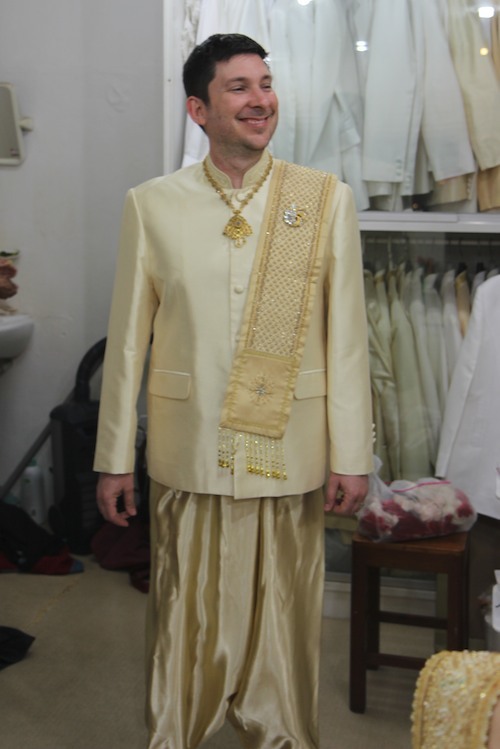 We got fitted for Thai wedding outfits, which was outrageous. I felt like a King, and April a Thai Princess. This was the pre-flight champagne. 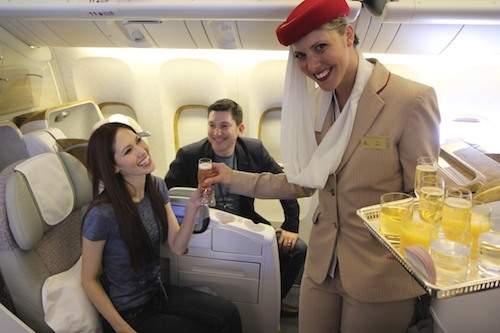 She was amazing, we got to talk a lot and will keep in touch I’m sure… fantastic Emirates service! All I can say was that their food was great … yes, that’s seared ahi. Yes, I look terrible after a long day’s journey … but the suit will be amazing for our wedding tomorrow… and you’ll just have to wait and see April’s! More as I can, leave those comments!